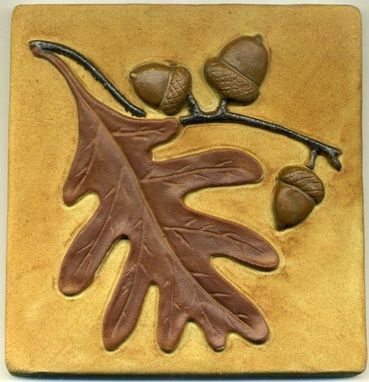 A 6" square tile, the oak leaf and acorn are sculpted shapes that stand in high relief. The tile is made of durable stoneware ceramic and suitable for use indoors or out. This design makes a stylish accent for a kitchen backsplash, fireplace surround or bathroom area. We also offer this design in a 4" square tile. Pricing below is per 6" tile. In this example, we made the decorative tiles plus the small corner accents. Our customer provided the border and field tile.